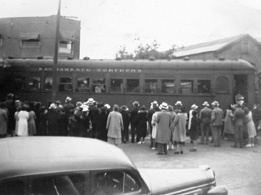 to Oroville, boarding car 1023, Sacramento Northern station, 40th and Shafter, 1938. 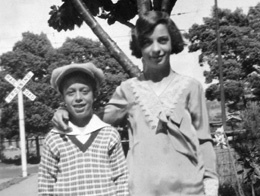 The Temescal Community Archive is an initiative to collect and catalog historic photographs, other two-dimensional documents, and oral interviews relating to Temescal's social history and physical development. Since 1997, through the generosity of dozens of former and current members of the Temescal community who have lent materials for use in Shared Ground's projects, we have accumulated approximately 2,000 historic documents. Volunteers have been cataloguing these materials in the conviction that preserving and celebrating local history deepens our sense of Temescal as a unique place, while sharing our stories with neighbors strengthens our connection to each other and across generations. The Temescal Community Archive will be accessible to the public through the Temescal Over Time website, now under development. Documents will include photographs, maps, newspaper articles, ephemera, video, and more, on a wide range of topics relating to Temescal and North Oakland. Temescal Over Time will also feature timelines, walking tours, a guide to researching the history of your house, and exhibits on special topics relating to the neighborhood. Are there old family photos for which you are seeking a caring home? Do you have materials relating to the history of your Temescal business, school, church, or social club? If so, share them with the Temescal Community Archive. You can choose to donate your original documents, or we can make copies of them and return the originals to you. Any future public use by Shared Ground of material we receive from you will acknowledge you or your family as the source, and you will retain all copyrights that apply. * Over 120 documents, including photographs, flyers, newspaper articles, and teaching manuals, pertaining to the history of the Studio One Art Center, from the collection of former long-time Studio One instructor, Terry Hatcher. * Newspaper articles, advertisements, and other ephemera from Temescal's recent past, donated by Temescal resident Dennis Brown. * Over 50 photographs of Temescal's early days, from the collection of Temescal native and local historian Ray Raineri. * Photographs, jourals, and other documents from the Matilda Brown Home, located in Temescal from 1873 until 2008 and one of California's earliest nonprofit organizations. * Family photographs and other ephemera from the Avanzino family, contributed by Ronald Avanzino. 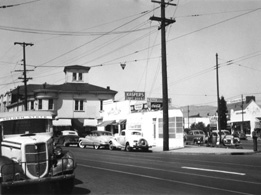 *	Photographs of Temescal residential and commercial streets from the 1940s and 1950s, from the Oakland History Room. *	Photographs of the Sacramento Northern Railway and depot at Shafter and 40th Street, contributed by Paul Smith. 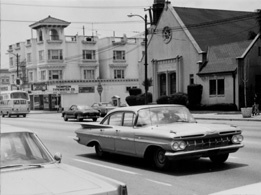 *	Photographs of Temescal streets from the 1960s, from the Oakland Cultural Heritage Survey. Keep in mind that documents which you think have no relevance to Temescal often can reveal something important about the neighborhood. Call us, and we will help you make that determination. Contact us to learn more about sharing your history with the Temescal Community. Copyright 2015 Shared Ground. All rights reserved.